Troops of the United States 7th Army liberated 33,000 prisoners this afternoon at this first and largest of the Nazi concentration camps. 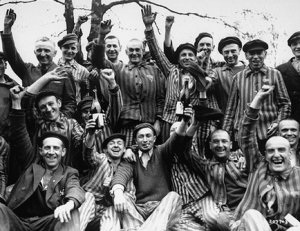 Some of the prisoners had endured for eleven years the horrors of notorious Dachau. The liberation was a frenzied scene: Inmates of the camp hugged and embraced the American troops, kissed the ground before them and carried them shoulder high around the place. The Dachau camp, in which at least a thousand prisoners were killed last night before the SS (Elite Guard) men in charge fled, is a grimmer and larger edition of the similarly notorious Buchenwald camp near Weimar. This correspondent and Peter Furst, of the Army newspaper, Stars and Stripes, were the first two Americans to enter the enclosure at Dachau, where persons possessing some of the best brains in Europe were held during what might have been the most fruitful years of their lives. While a United States 45th Infantry Division patrol was still fighting a way down through S.S. barracks to the north, our jeep and two others from the 42d Infantry drove into the camp enclosure through the southern entrance. As men of the patrol with us busied themselves accepting an S.S. man’s surrender, we impressed a soldier into service and drove with him to the prisoners’ barracks. There he opened the gate after pushing the body of a prisoner shot last night while attempting to get out to meet the Americans. There was not a soul in the yard when the gate was opened. As we learned later, the prisoners themselves had taken over control of their enclosure the night before, refusing to obey any further orders from the German guards, who had retreated to the outside. The prisoners maintained strict discipline among themselves, remaining close to their barracks so as not to give the S.S. men an excuse for mass murder. But the minute the two of us entered, a jangled barrage of “Are you Americans?” in about 16 languages came from the barracks 200 yards from the gate. An affirmative nod caused pandemonium. Tattered, emaciated men weeping, yelling and shouting “Long live America!” swept toward the gate in a mob. Those who could not walk limped or crawled. In the confusion, they were so hysterically happy that they took the S.S. man for an American. During a wild five minutes, he was patted on the back, paraded on shoulders and embraced enthusiastically by the prisoners. The arrival of the American soldier soon straightened out the situation. I happened to be the first through the gate, and the first person to rush up to me turned out to be a Polish Catholic Hlond, Primate of Poland, who was not a little startled to discover that the helmeted, uniformed, begoggled individual he had so heartily embraced was not a man. In the excitement, which was not the least dampened by the German artillery and the sounds of battle in the northern part of the camp, some of the prisoners died trying to pass through electrically charged barbed wire. Some who got out after the wires were decharged joined in the battle, when some ill-advised S.S. men holding out in a tower fired upon them. The prisoners charged the tower and threw all six S.S. men out the window. After an hour and a half of cheering, the crowd, which would virtually mob each soldier that dared to venture into the excited, milling group, was calmed down enough to make possible a tour of the camp. The only American prisoner, a flyer, with the rank of major, took some of the soldiers through. According to the prisoners, the most famous individuals who had been at the camp had been removed by S.S. men to Innsbrueck. Among them were Leon Blum, former French Premier, and his wife; the Rev. Martin Niemoeller, German church leader; Kurt Schuschnigg, Chancellor of Austria at the time of the anschluss (he was said to have been alive a few days ago); Gabriel Piquet, Bishop of St. Etienne; Prince Leopold of Russia; Baron Fritz Cirini, aide to Prince Leopold; Richard Schmitz, former Mayor of Vienna; and Marshal Stalin’s son, Jacob. The barracks at Dachau, like those at Buchenwald, had the stench of death and sickness. But at Dachau there were six barracks like the infamous No. 61 at Buchenwald, where the starving and dying lay virtually on top of each other in quarters where 1,200 men occupied a space intended for 200. The dead—300 died of sickness yesterday—lay on concrete walks outside the quarters and others were carried out as the reporters went through. The mark of starvation was on all the emaciated corpses. Many of the living were so frail it seemed impossible they could still be holding on to life. The crematorium and torture chambers lay outside the prisoner inclosures. Situated in a wood close by, a new building had been built by prisoners under Nazi guards. Inside, in the two rooms used as torture chambers, an estimated 1,200 bodies were piled. In the crematorium itself were hooks on which the S.S. men hung their victims when they wished to flog them or to use any of the other torture instruments. Symbolic of the S.S. was a mural the S.S. men themselves had painted on the wall. It showed a headless man in uniform with the S.S. insigne on the collar. The man was astride a huge inflated pig, into which he was digging his spurs. The prisoners also showed reporters the grounds where men knelt and were shot in the back of the neck. On this very spot a week ago a French general, a resistance leader under General Charles de Gaulle, had been killed. Just beyond the crematorium was a ditch containing some 2,000 bodies, which had been hastily tossed there in the last few days by the S.S. men, who were so busy preparing their escape they did not have time to burn the bodies. Below the camp were cattle cars in which prisoners from Buchenwald had been transported to Dachau. Hundreds of dead were still in the cars due to the fact that prisoners in the camp had rejected S.S. orders to remove them. It was mainly the men from these cattle cars that the S.S. leaders had shot before making their escape. Among those who had been left for dead in the cattle cars was one man still alive who managed to lift himself from the heap of corpses on which he lay.